Amazonite: Mineral information, data and localities. Named in 1847 by Johann Friedrich August Breithaupt for an unspecified type locality area "near" the Amazon River. A green to blue-green variety of K-feldspar, usually microcline, but sometimes applied to orthoclase. However, there are also indications that the green color of some microcline is caused by divalent Fe (Szuzkiewicz & Körber, 2010). Overenthusiastic uses of this name include giving this name to slightly gray-green hues in microcline that are often photosensitive and turn from greenish gray to light smoky gray. Sunlight can sometimes enrich the color of genuine amazonite. Visit gemdat.org for gemological information about Amazonite. Smoky Quartz 252 photos of Amazonite associated with Smoky Quartz on mindat.org. Albite 99 photos of Amazonite associated with Albite on mindat.org. Cleavelandite 71 photos of Amazonite associated with Cleavelandite on mindat.org. Microcline 45 photos of Amazonite associated with Microcline on mindat.org. Quartz 34 photos of Amazonite associated with Quartz on mindat.org. Schorl 34 photos of Amazonite associated with Schorl on mindat.org. Topaz 28 photos of Amazonite associated with Topaz on mindat.org. Fluorite 16 photos of Amazonite associated with Fluorite on mindat.org. Feldspar Group 9 photos of Amazonite associated with Feldspar Group on mindat.org. Goethite 9 photos of Amazonite associated with Goethite on mindat.org. Cech, F., Misar, Z., Povondra, P. (1971) Green lead-containing orthoclase. Tschermaks Mineralogische und Petrographische Mitteilungen: 15: 213-231. Hofmeister, A.M., Rossman, G.R. 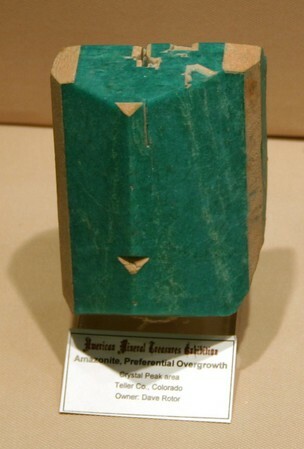 (1985) A spectroscopic study of irradiation coloring of amazonite: structurally hydrous, lead-bearing feldspar. American Mineralogist: 70: 794-804. Stevenson, R.K., Martin, R.F. (1986) Implications of the presence of amazonite in the Broken Hill and Geco metamorphosed sulfide deposits. The Canadian Mineralogist: 24: 729-745. Petrov, I., Mineeva, R.M., Bershov, L.V., Agel, A. (1993) EPR of lead-lead mixed valence pairs in amazonite-type microcline. American Mineralogist: 78: 500-510. Julg, A. (1998) A theoretical study of the absorption spectra of Pb+ and Pb3+ in site K+ of microcline: application to the color of amazonite. Physics and Chemistry of Minerals: 25: 229-233. Murakami, H., Takashima, I., Nishida, N., Shimoda, S., Matsubara, S. (2000) Solubility and behavior of lead in green orthoclase (amazonite) from Broken Hill, New South Wales, Australia. Ganko: 95: 71-84. 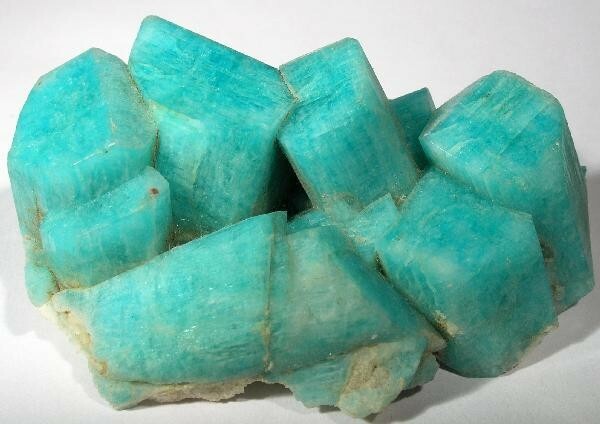 The following Amazonite specimens are currently listed for sale on minfind.com. Girdauskas Minerals specimen, via Eugene Carmichael collection, allegedly Pb-rich, associated with spessartine. Barnes L. C., et al, (1980), Some Semiprecious and Ornamental Stones of South Australia, Government Printer, Adelaide, South Australia. Greg Dainty colln. CanRockhound v.3, n.1; Canadian Mineralogist 41:117-137; Northern Mineral Showings Database, NWT Geoscience Office. Rocks and Minerals For The Collector: Ottawa to Northbay, Ontario; Hull to Waltham; Hugh S. Spence (1930) Pegmatite minerals of Ontario and Quebec. American Mineralogist 15:430-450; Sangster, P.J., McGuinty, W.J., Papertzian, V.C., Steele, K.G., Lee, C.R., Barua, M., Laidlaw, D.A. and Carter, T.R. 2003. Report of Activities 2002, Resident Geologist Program, Southern Ontario Regional Resident Geologist Southeastern and Southwestern Districts, Mines and Minerals Information Centre, and Petroleum Resources Centre; Ontario Geological Survey, Open File Report 6115, 118p. Sabina, A. P. (2007) Rocks and Minerals for the Collector, Ottawa to North Bay and Huntsville, Ontario; Gatineau (Hull) to Waltham and Témiscaming, Quebec. Geological Survey of Canada, Miscellaneous Report 48, 249p. Bin Chen and Borming Jahn (2002): Geological Magazine 139, 1-13. Burkart E.(1953):Moravské nerosty a jejich literatura.Nakl.ČSAV,Praha; Gadas, P., Novák, M., Talla, D., & Galiová, M. V. (2013). Compositional evolution of grossular garnet from leucotonalitic pegmatite at Ruda nad Moravou, Czech Republic; a complex EMPA, LA-ICP-MS, IR and CL study. Mineralogy and Petrology, 107(2), 311-326. Škoda, R., Novák, M., Houzar, S.: Granitické NYF pegmatity třebíčského plutonu. Acta Musei Moraviae, Scientiae geologicae, 2006, roč. 91, s. 129 - 176. Helba, H., Trumbull, R.B., Morteani, G., Khalil, S.O., and Arslan, A. (1997): Mineralium Deposita 32, 164-179. Küster, D. (2009): Ore Geology Reviews 35, 68-86. Nakano, S., & Makino, K. (2010). Amazonitic alkali feldspar from the Tanakami Granitic pegmatite, southwest Japan. Journal of mineralogical and petrological sciences, 105(2), 45-56. Behier, J. (1963): Carte mineralogique de Madagascar. Archive Service Géologique Madagascar. A 1871. Sanbonsugi, M. (1943) Miscellaneous Reports, Geological Survey of Korea, no. 12. Kondo, C. (1940) Jour. Min. Soc. Korea, 23, 11. Bermanec, V., Palinkas, L., Strmić Palinkas, S., Gault, R., Boev, B., & Zebec, V. (2001). Mineralogy of pegmatite with giant epidote crystals, near Chanishte, Macedonia. in Mineral Deposits at the Beginning of the 21st Century, Piestrzyf1ski at al (ads), pp 939-942.; Palinkaš, S. S., Bermanec, V., Palinkaš, L. A., Boev, B., Gault, R. A., Prochaska, W., & Bakker, R. J. (2012). The evolution of the Čanište epidote-bearing pegmatite, Republic of Macedonia: evidence from mineralogical and geochemical features. Geologia Croatica, 65(3), 423-434. Frigstad, O.F. (1968) En undersøkelse av cleavelandittsonerte pegmatittganger i Iveland-Evje, Nedre Setesdal. Hovedfagsoppgave (Thesis), University of Oslo. Stensrud, S. (2009): De opptredende mineraler på granittpegmatittganger i Iveland og Evje. Unpublished paper based on 4 previous papers written together with Johan Løchen. Neumann, H. (1960): Mineral occurrences in southern Norway. Guide to excursions no A.15 and no. C 12. International Geological Congress XXI session Norden 1960, 18p. Raade, G. (1982): Svabitt fra Hellemofjorden. in Geologisk Museum. Interne notater 1961-1990. Published by Geologisk Museums Venner, Oslo 1991, p 99. Pekov, I. (1998) Minerals First discovered on the territory of the former Soviet Union 369p. Ocean Pictures, Moscow; Bailey, J. C: Formation of cryolite and other aluminofluorides: A petrologic review. Bull. geol. Soc. Denmark, vol. 29, pp. 1-45. Copenhagen, June 10th, 1980. Bruce D. Marsh (1996) Solidification fronts and magmatic evolution. Mineral Mag 60: 5-40. Ostroumov M.N., Musina I.M., Vokhmentsev A.Ya. [Остроумов М.Н., Мусина И.М., Вохменцев А.Я.] (1975): Colour variation and perthitic texture of amazonite from the pegmatite of Ploskaya Mountain (Kola Peninsula) [Вариация окраски и пертитовое строение амазонита из пегматита горы Плоской (Кольский п-ов)]. Zap. VMO [Зап. ВМО], 104, 6, 738-741 (in Russian); Kievlenko E.Ya., Senkevich N.N. [Киевленко Е.Я., Сенкевич Н.Н.] (1983): Geology of semi-preciuos stone deposits [Геология месторождений поделочных камней], 2nd edition. Nedra, Moskow, 263 pp. (in Russian); Voloshin A.V., Pakhomovskii Ya.A. [Волошин А. В., Пахомовский Я. А.] (1986): Minerals and evolution of mineral formation in amazonite pegmatites of the Kola Peninsula [Минералы и эволюция минералообразования в амазонитовых пегматитах Кольского полуострова]. Nauka, Leningrad, 168 pp. (in Russian); Vokhmentsev A.Ya., Ostroumov M.N., Marin Yu.B., Popov V.A., Tarashchan A.N., Shmakin B.M. [Вохменцев А.Я., Остроумов М.Н., Марин Ю.Б., Попов В.А., Таращан А.Н., Шмакин Б.М.] 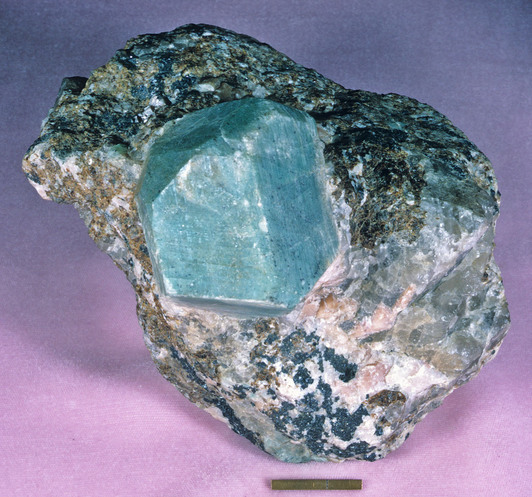 (1989): Amazonite [Амазонит]. Nedra, Moscow, 192 pp. (in Russian). Pekov, I.V., Chukanov, N.V., Kononkova, N.N., Yakubovich, O.V., Massa, W., Voloshin, A.V. (2008): Tveitite-(Y) and rare-earth enriched fluorite from amazonite pegmatites of Western Keivy, Kola Peninsula, Russia. Genetic crystal-chemistry of natural Ca,REE-fluorides. Zapiski RMO (Proceedings of the Russian Mineralogical Society), 137(3), 76-93. Kuznetsova, L. G. (2009). Uncommon rare-elements spectrum and geochemical evolution of the Tastyg spodumene granitoids (South Siberia, Russia). Estudos Geol, 19(2), 150-155.
http://www.minsocam.org/MSA/Special/Pig/PIGarticles/Zaraisky.html (Previously published in: Mineral Deposits: Research and Exploration Where do They Meet? Proceedings of the Fourth Biennial SGA Meeting , Turku/Finland/11-13 August 1997 , Heikky Papunen (ed. ), A.A. Balkema, Rotterdam, Brookfield, 1997, pp.695-698). http://www.minsocam.org/MSA/Special/Pig/PIG_articles/Zaraisky.html (Previously published in: Mineral Deposits: Research and Exploration Where do They Meet? Proceedings of the Fourth Biennial SGA Meeting , Turku/Finland/11-13 August 1997) and F.G. Reyf et al. , The Canadian Mineralogist, 2000, Volume 38, number 4, Pages 915-936.; Thomas, R., Davidson, P., & Badanina, E. (2009). A melt and fluid inclusion assemblage in beryl from pegmatite in the Orlovka amazonite granite, East Transbaikalia, Russia: implications for pegmatite-forming melt systems. Mineralogy and Petrology, 96(3-4), 129-140. Calvo, M. (2018). Minerales y Minas de España. Vol IX. Silicatos. Escuela Técnica Superior de Ingenieros de Minas de Madrid. Fundación Gómez Pardo. 767 págs. A. Pitawala, T.H.N.G. Amaraweera, G.W.A.R. Fernando, C.A. Hauzenberger (2008): Pegmatites Derived from Fractionation of a Melt: an Example from Pegmatites in the Owala-Kaikawala area, Matale, Sri Lanka. Journal of the Geological Society of India, 72, 815-822. Augsten, R. (2010): Mineralientouren nach Skandinavien (III). Lapplands bunte Farben: Manganmineralien vom Tjaktjajaure, Ultevis, Schweden. Lapis, 35 (2), 39-41. P,M. Kartashov data; Konovalenko, S. I., Voloshin, A. V., Pakhomovskiy, Y. A., Anen'yev, S. S., Perlina, G. A., Rogachev, D. L., & Kuznetsov, V. Y. (1984). Tusionite, MnSn (BO3) 2, A New Borate from Granite Pegmatite of Southwestern Pamir. International Geology Review, 26(4), 481-485.
www.mineralsocal.org; Strong, Mary Frances Berkholz (1964), Gem valley in the Inyo Mountains: Gems & Minerals, No. 317, Feb. 1964: 20; Murdoch, Joseph & Robert W. Webb (1966), Minerals of California, Centennial Volume (1866-1966): California Division Mines & Geology Bulletin 189: 183.; Griffis, R.A. (1987), Kern knob pluton and other highly-evolved granitoids in East-central California, M.Sc. Thesis, California State University, Northridge. Meeves, H., et al (1966), Reconnaissance of beryllium-bearing pegmatite deposits in six western states, US Bur. Mines Info. Circ. 8298: 25 (Table A-1). American Mineralogist (1936): 20: 319-333; Minerals of Colorado (1997) Eckel, E. B.
Amefican Mineralogist, Volume 70, pages 794-804, 1985; C. C. Hawley, Claude Huffman, Jr., J. C. Hamilton, and L. F. Rader, Jr (1966) Geologic and geochemical features of the Redskin Granite and associated rocks, Lake George beryllium area, Colorado. in USGS Professional Paper: 550-C pp138-147. Bull. Minéral. , 1984, 107, pp. 411-422. Sears, John Henry (1905): The Physical Geography, Geology, Mineralogy and Paleontology of Essex County, Massachusetts; Eckert (1987): Earth Treasures Vol.1: The Northeastern Quadrant. Sears, J. H.(1905): The Physical Geography, Geology, Mineralogy and Paleontology of Essex County. Emerson, B. K. (1895): A Mineralogical Lexicon of Franklin, Hampshire, and Hampden Counties, Massachusetts (USGS Bulletin 126). ⓘ Passaconway Gravel pit ? Morrill, P. (1960) New Hampshire Mines and Mineral Localities, 2nd edition. Dartmouth College Museum, Hanover, New Hampshire, 46 pages. Michael N. Spilde, Steve Dubyk, Brian Salem, and William P. Moats, (2011) Rare earth bearing-minerals of the Petaca district, Rio Arriba County, New Mexico. New Mexico Geological Society Fall Field Conference Guidebook – 62 Geology of the Tusas Mountains and Ojo Caliente pp. 389-398. The Minerals of New York City & Its Environs, New York Mineralogical Club Bull. Vol. 3, No. 1, Manchester, J.G. (1931): 95. Miller, C. E. (1971) "Rhode Island Minerals and Their Locations," University of Rhode Island, Kingston. Rocks & Min. : 60: 165.; Arthur A. Pegau (1932) Pegmatite Deposits of Virginia. Virginia Geological Survey; Bulletin 33. [Virginia Minerals, Vol 46:2]; Richards, R. P., Kearns, L. E., & Cook, W. R. (1998). Morphology of Chiolite twins from the Morefield mine, Amelia County, Virginia. Canadian mineralogist, 36, 1009-1016.